It’s no mystery that the Dundalk Community Theatre has been producing top-quality live shows for over forty years. Now in its forty-second season, DCT is producing The 39 Steps, an incredibly fast-paced romp through the story of Alfred Hitchcock’s film based off the novel by John Buchan of the same title. The 39 Steps is an affectionate and hilarious spoof of the film and novel brought to life onto the stage, featuring four insanely talented actors playing one hundred and fifty roles. 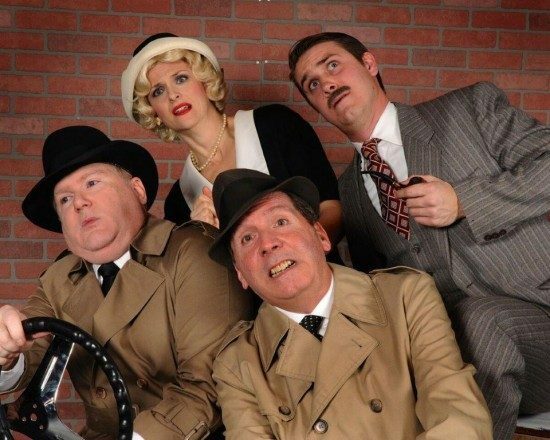 …DCT’s production of ‘The 39 Steps’ is worth seeing if you like a madcap mystery, sizzling romance, and hilarious comedy in the style of Monty Python. What makes the play so much fun is that in Patrick Barlow’s play adaptation, 3 men and 1 woman play all the roles. The hero, Richard Hannay (a dashing Charles Lidard), is played by one man throughout. The roles of Annabella, Pamela and Margaret (a beautiful and mysterious Tatiana Dalton) are played by the woman in the cast. All the other characters, approximately 150, are played by the two other men in the cast, classified in the program as Clown 1 (in a memorable performance by Patrick Martyn) and Clown 2 (played with perfect comedic timing by Thomas C. Hessenauer). The plot is centered around Richard Hannay who is wrongly accused of murder. Many madcap adventures ensue as he is pursued by the authorities. On the run, Hannay tries to clear his name and solve the mystery of an espionage organization called the “The 39 Steps.” Along the way, much love is abound when Hannay gets handcuffed to a beautiful woman. Will the true villains be exposed and our hero vindicated? Talented director Todd Starkey brings the script to life which is full of allusions to other Hitchcock films, including “Strangers on a Train,” “Rear Window,” “Psycho,” “Vertigo,” and “North by Northwest.” Todd Starkey made it a point to tell me that the running crew, sound operators, and dressers also deserve credit for helping to make the comedic timing work as good as it does. The set, lights, and sound play an important role in DCT’s production. Here Marc W. Smith creates with simplicity, appropriate sets, lights, music, and sound effects to help create the train top chase, the Forth Bridge escape, and the Mr. Memory scene at the Palladium. Overall, DCT’s production of The 39 Steps is worth seeing if you like a madcap mystery, sizzling romance, and hilarious comedy in the style of Monty Python. The 39 Steps plays through March 6, 2016 at Dundalk Community Theatre— College of Baltimore County Dundalk in Building K, at the John E. Ravekes Theatre – 7200 Sollers Point Road, in Baltimore, MD. For tickets, call the box office at (443) 840-2787, or purchase them online.